So I love this dish, like a lot. It’s a Kraft recipe that you can find here. 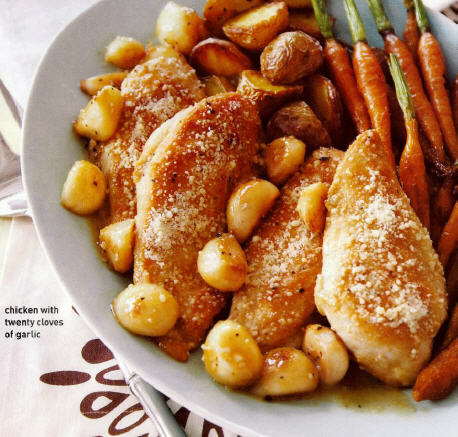 If you happen to click on that link you’ll notice that it says that in France, they make this dish with 40 cloves of garlic instead of 20. I might just have to make it with 40 next time. I made this dish for girls night the other night and we were all calling “DIBS!” on the garlic cloves. Soooo yummy. Using the pre-peeled garlic makes all the difference in the world with this dish. You can cut your prep down to about two minutes by using this which means that you can pop this on the stove quick, fast and in a hurry on a weeknight. The picture shows this dish being served with roasted carrots and potatoes but I felt like this made for a really monochromatic dish so I served it with marinated tomatoes and the Buttery Almond Green Beans. I’ll be sharing the tomato recipe soon.